12 seat minibus hire is one of the most widely used forms of rental vehicle in the UK; along with 15 and 17 seaters the 12 seater is used on a daily basis and is well known for its versatility and passenger space. 12 seat minibuses cater to groups of 9-12 people and give the comfort of a larger bus while remaining fairly compact. The most popular 12 seat minibus on the market is the Ford Transit and is based on the chassis of its sister van model. Unlike a van conversion, a minibus is designed to provide a large seating area and a more spacious area for the driver. The 12 seat minibus is the ideal choice of vehicle for small groups to travel in comfort to a destination. They are regularly used to transport business associates to corporate meetings, kids on school trips and holiday makers requiring transfer, they also prove to be a cost effective alternative to the use of multiple taxis. Travelling through cities is made easy in 12 seater minibus as they are not as large and cumbersome as a public bus but too small to impact upon comfort if a trip takes longer than expected. 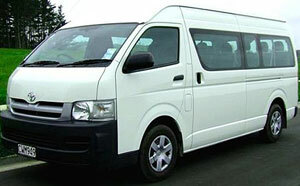 Modern 12 seat minibus hire is also one of the safest methods of transport available. Older models that contained lap seatbelts or in some cases no seatbelts at all have be ousted in favour of forward facing seats and a three point seat belt system. Drivers are also better taken car off with front and side airbags in both driver and passenger sides of the front cabin. There is a big market in the UK for 12 seat minibus hire and thousands of locations across England, Scotland, Wales and Northern Ireland that can provide your group with the ideal vehicle. The amount of competition can only be a good thing for the consumer as prices are kept competitive. Some companies also provide a price match in which they will meet or beat your best quote as a way to gain custom. A city’s main tourist area is often a good place to look for available minibus hire and many companies will base there depot directly in the heart of a city to attract new custom, for example, in and around Leicester Square in London and Princes Street in Edinburgh would be good places to look. Airports are the biggest market place for vehicle rental companies and both local and national companies base themselves in UK airports as a way to gain the custom of incoming visitors to a city. Airports also present a good way for residents of a city to find 12 seat minibus hire as they are often within easy access by road and rail. Shopping around for the best quotes will give you a chance to drive the price of hire down; comparison websites are a good way of finding the best priced hire in your area.